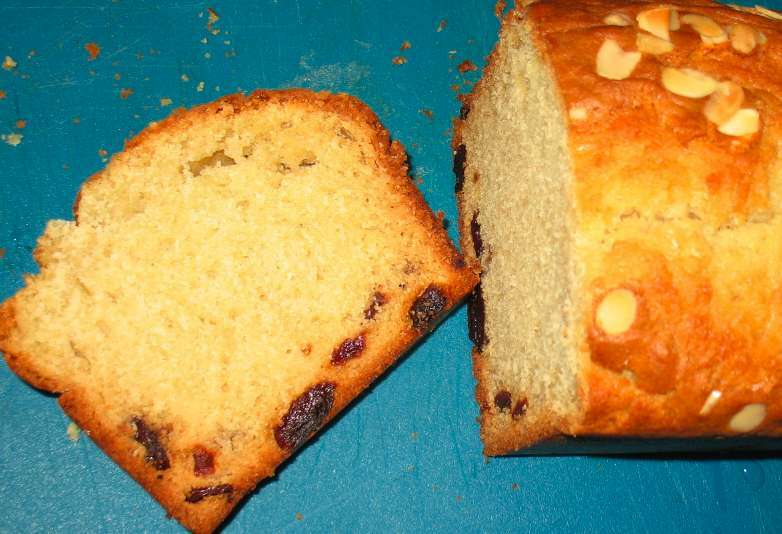 The only disappointing thing about the cherry and almond bread was that all the cherries sunk to the bottom of the mixture. I’ve read a couple of other blogs mentioning this, the solution is supposedly half way through add more cherries. These don’t have the time to sink as the teabread is firming up, so you get more evenly spaced cherries. I think I am going to try this technique next time. This recipe is largely the same as the one in Good Housekeeping Great Baking, however I reduced the amount of sugar (mainly because so much sugar scared me a little) and used semi-skimmed milk instead of sour cream. As usual I replaced the butter with 3/4 coconut oil and omitted the salt. Preheat oven to 180oC. Grease 9″ by 5″ loaf tin, I used the low-cal cooking spray to grease my tin. In a medium bowl mix the flour, baking powder and baking soda. In another bowl beat coconut oil until smooth, in the recipe it says to blend at low speed with a mixer, but that always causes me a huge mess in the kitchen, as it sprays all over the place. I normally mix with a fork until smooth. Add the sugar and mix with fork will the coconut oil and sugar are combined, then blend at low speed with blender. Add the eggs and continue to blend, scrape the sides occasionally to ensure everything is added to the mixture. Mix in the vanilla and almond extracts. Next add spoonfuls of flour and milk alternately and continue to blend. Fold in the cherries. Spoon the batter into the tin, and cook for 1 hour and 5 minutes, adding the sliced almonds to the top. until a tooth pick comes out clean. Leave the loaf in the pan for 10 minutes to cool, then remove from tin and leave on wire rack to cool.